Vanderbilt Campus Dining has apps for iOS and Android! 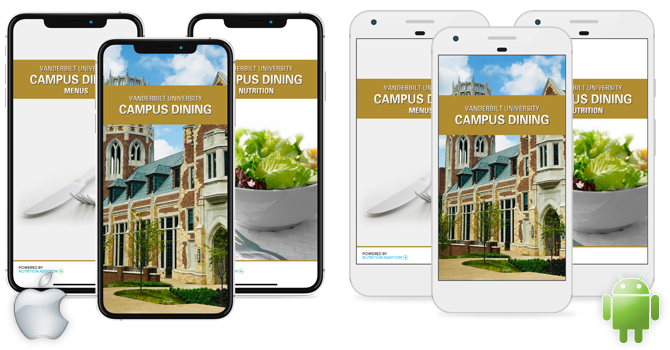 Campus Dining: The Campus Dining app is the best way to get accurate information about when, where, and what to eat on the Vanderbilt campus. Complete with the What’s Open feature, complete hours of operation, daily menus, restaurant/market descriptions, Taste of Nashville, special events, social media, meal plan information, campus maps and more… it’s a must-have. Menus: Review the menus for all of Vanderbilt Campus Dining on-campus restaurants. See what is being served for breakfast, lunch, or dinner today or a few days from now at any of our many locations. Download these apps on the App Store and on Google Play by following the links below.